Installation view of the exhibition, courtesy Modern West Fine Art. Something remarkable, though it shouldn’t have been, took place in the American Southwest in the years following the Second World War. Consider these three names: Georgia O’Keeffe, Agnes Martin, Beatrice Mandelman. Each of these artists resisted and ultimately rejected the New York mainstream. Each created original and highly personal ways of making art. And each, after feeling the pull of a remote desert location, eventually settled permanently in New Mexico. They were by no means the only, or even the most important Americans making art, but their eventual success pointed to serious flaws in the way women were recognized as artists, not only by society, but by the mainstream art establishment. It’s helpful to compare the way their names became established with the story, for example, of Lee Krasner, who stayed in New York, where she achieved a genuine, but lower-tier renown while continuing to be defined by reference to her husband, Jackson Pollock, as though long after his death she remained his appendage. O’Keeffe, Martin, and Mandelman succeeded finally under their own identities, establishing independent reputations in the manner of leading male artists. Perhaps the most telling fact about them is the way their regard has continued to grow over time. Bea Mandelman, perhaps the least known until now, has lagged behind in name recognition in part because the Taos Modernists, the movement with which she was primarily associated, remained informal, its members preferring to allow themselves to be seen as a continuation of the established Taos art community, rather than setting themselves apart to the detriment of the long-established and flourishing community. Additionally, many of its members were known before, after, or elsewhere than Taos, which diluted the impact of what happened in Taos among various other contemporary movements. And in a final irony, her success in building a lasting marriage to her husband, Louis Ribak, has diminished her achievement in a way her presence in his life hasn’t affected him. Only now, after several decades of reevaluating women artists, are the accomplishments of their remarkable collaboration getting the kind, if not the level, of recognition that Picasso and Braque, van Gogh and Gaugin, or Rauschenberg and Johns have received. There are painters who are stars, or want to be: who stake a claim on history and pursue an early goal for their entire careers. Then there are those who just love paint, who marvel at the material’s flexible capabilities, who will try any approach and whose catalog ends up looking like they could never make up their minds. Louis Ribak was that kind of painter. 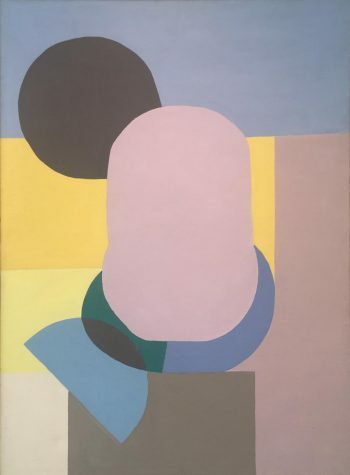 Born in 1902 in Lithuania, a tiny Baltic state that made a disproportionately large contribution to 20th-century art, he emigrated with his family to New York City in 1912, the year Bea Madelman was born. Ribak turned 21 while studying art with John Sloan at the Art Students League, at the beginning of a remarkable career. By then the Communist experiment was well underway in his ancestral home region, which may have influenced his interest in leftist politics, though there was plenty of social realism for him to encounter in American art, even before the beginning of the Great Depression in 1929. The scenes he painted during those years often mask incisive economic and class criticism behind charming images of immigrant life. By 1933, Ribak was assisting the Mexican muralist Diego Rivera on the notorious Rockefeller Center fiasco. Bea Mandelman’s parents were also immigrants, though she was born in America. By the age of 12 she was determined to spend her life as an artist. Thanks to recent interest in her work, far more is now known about her early influences, including her intensive study of international, modern art and artists. Before she met Ribak, she had taken part in an expansion of 20th– century art that would later become one of its signatures, especially of Pop art: she was an original member of the WPA Silk Screen Unit, which transformed what had been an industrial medium into a medium of art making. 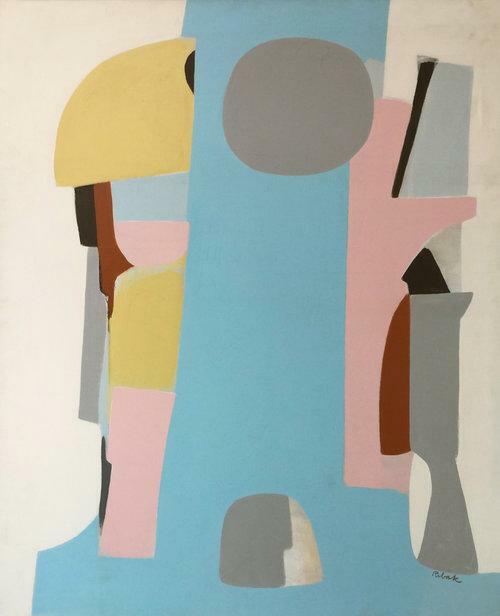 Throughout, her work focused on issues of social justice expressed through abstract imagery. Mandelman and Ribak were introduced at a dance sponsored by the Artists Union and they were married soon after, in 1942. Ribak was drafted that year, but after two years in military service he was released due to asthma. While they were undoubtedly interested in finding a healthier climate for him, it was an invitation from Sloane to visit him in Santa Fe that brought them to the Southwest. What happened next is worth conjecturing: Mandelman, a lifetime New Yorker, unready to exchange that great city for a lesser version, must have been utterly blindsided, and ultimately seduced when she discovered Taos, a village built around an ancient pueblo that had been home to countless artists over the years. Before addressing the paintings, it’s worthwhile to say a few things about their history as it affects their present condition. Anyone who primarily sees art in museums is likely to have an unrealistic impression of how quickly art can age. The oil used in most painting begins to break down as soon as it dries. Keeping a painting looking like it did when new requires care and periodic repair. The large cache of Mandelman and Ribak paintings left behind by the artists after his death in 1979 and hers in 1998 presents a challenge to anyone interested in preserving their legacy, including Rosenberg & Co. gallery in New York and the University of New Mexico Foundation, who together made this exhibition possible. Although these works aren’t as old as most of the masterpieces held in museums, as objects those paintings have received attention over the centuries commensurate with their values, while the works now at Modern West more typically resemble paintings held in private hands. This is arguably an advantage, as their aesthetic age—their aura or presence as works representative of painting half a century ago—is reinforced by their age-appropriate physical appearance. They do a much better job of placing the viewer in the presence of Bea Mandelman and Louis Ribak than they would if they were embalmed and behind glass. At the same time, the working artists who created them lacked the army of trained assistants today’s artists of similar stature are able to employ, who keep track of dates and locations as a matter of course. It comes as a surprise to read, on the card next to the canvas, a date bracket spanning two decades. Yet without precise dates on the works, tracking the development of the artists becomes a matter of inference and detection, in which guesses threaten to become self-fulfilling arguments. Under the circumstances, it makes more sense to draw on connections between the works to date them, as Cooper has done here, rather than to use the dates to infer connections. Take, for instance, Mandelman’s “Dark Noon” and Ribak’s “Blue Circle,” two small pieces, each composed of six or seven geometric shapes. Hers is built of four horizontal bands: adobe brown on top, then light blue, earthy green, and white. 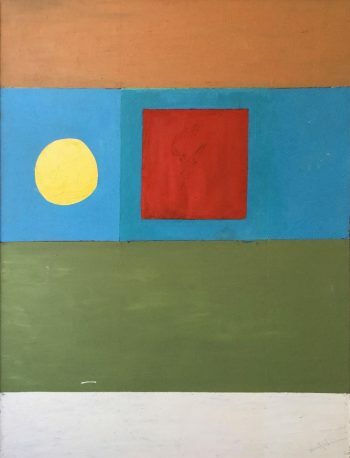 A yellow circle in the blue suggests the sun, presenting a possible analogy to a window opening on sky and grass, were it not for a bloody red square that displaces the yellow circle toward the margin. 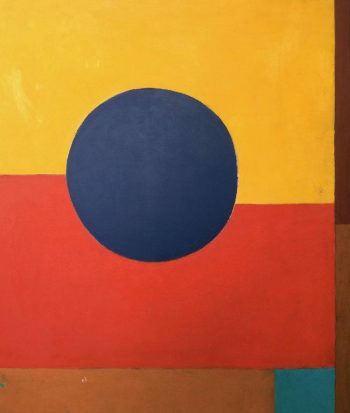 As suggested by her remarks at the time, the horizontal bands exert a calming effect on the conflict between the circle and the square, yet fails to resolve the tension between them. Ribak’s circle is dark blue and either masks or causes a displacement of the border between yellow and orange fields. Combined with a light blue square in the lower corner, a brown band on the edge, and our tendency to view from left to right, the overall effect suggests a tentative desire to approach the viewer diagonally, indirectly. 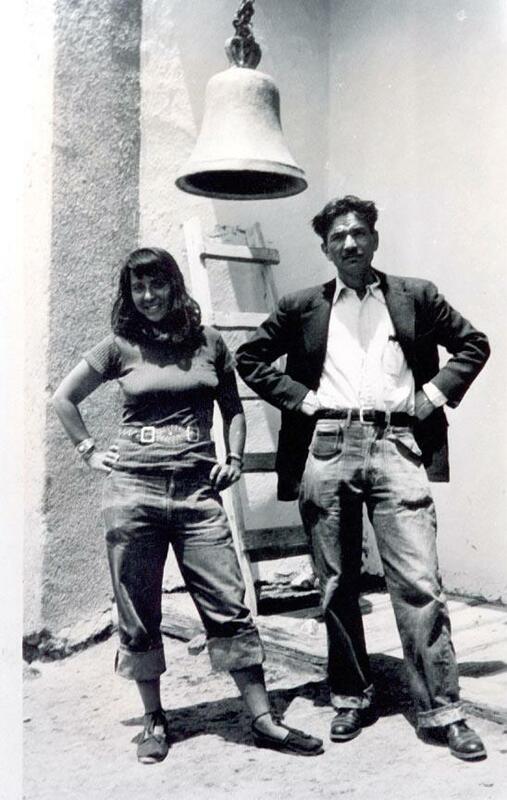 One explanation that has been given for the couple’s departure from New York was the failure of earlier, socially conscious movements in the face of Abstract Expressionism, an aggressive movement centered on expressing the egos of the artists. Both Mandelman and Ribak eventually paid their respects to AbEx, but neither really demonstrated obeisance to its tenets. 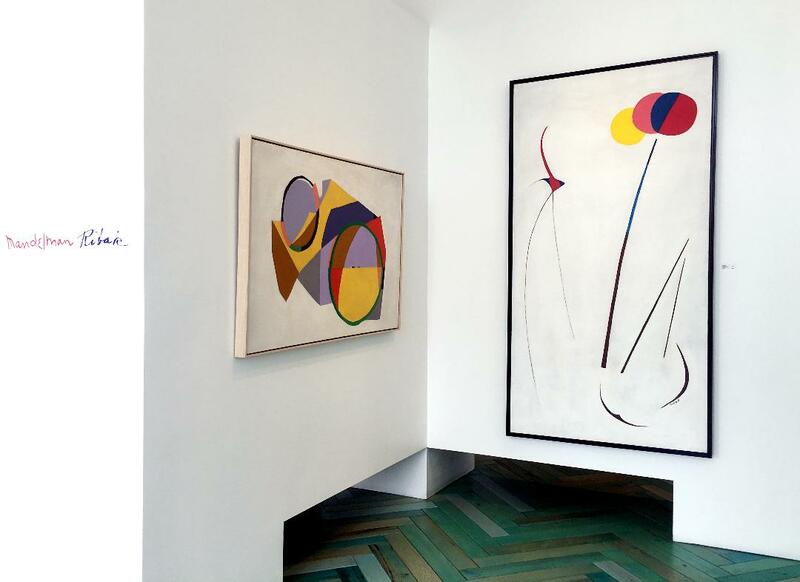 So viewers seeking meaning could say that in these two works, Mandelman sticks by her longtime desire to find non-objective ways of representing society’s recent conflicts, while Ribak yields to the Abstract Expressionists’ desire to paint autobiography, here revealing nothing less than his conflict with the triumph of abstraction. It was about this time, after all, that he said that as an artist he was “not truly anything. I am against everything. Damned abstracts, realists, illustrators . . .” The blue object may not represent him, but his desire to approach his audience directly, and the difficulties imposed on him by the times he found himself inhabiting, could be in evidence here. Most of the paintings here are more complex than these two, and will provide ample opportunity for original responses. Seeing the similarities between his and hers, and picking out each of their individual distinctions is as good as a semester of advanced Art Appreciation. Meanwhile, abstract art, contrary to a common misunderstanding, is more approachable than representational painting. With the imagery set aside, what you feel is all you need to get. That said, there is far more to be found here, with the work’s textures and the artists’ choices clearly visible, than in any reproduction. This goes double for Mandelman’s collage paintings, which make up her best work. Here the layers of various materials in a sense stand in for the subject matter she omits. The real world enters these pieces not as visual copies, but as real fragments that are painted on and over, forming layers in a process that proceeds from the ground up, cumulatively, like the lives and works of these two exceptional, too long overlooked artists. Mandelman & Ribak, featuring works by the artists from the 1960s and 1970s, Modern West Fine Art, Salt Lake City, through June 9.